Natura Bona's Pure Eucalyptus Essential Oil is the preferred brand used in many elite spas across the United States. Now you can experience the same spa effect at home with our unmatched aromatic pure therapeutic grade eucalyptus essential spray oil. Spray around your hot bath, shower room and sauna or any place where steam is generated to infuse the entire room with the invigorating, cleansing power of eucalyptus oil. Analgesic effect - For any tired or overused muscle, including feet. Removes stale air and eliminates smoke odors. Experience the benefits of Natura Bona's pure and undiluted Eucalyptus Essential Oil. A must have for every home! 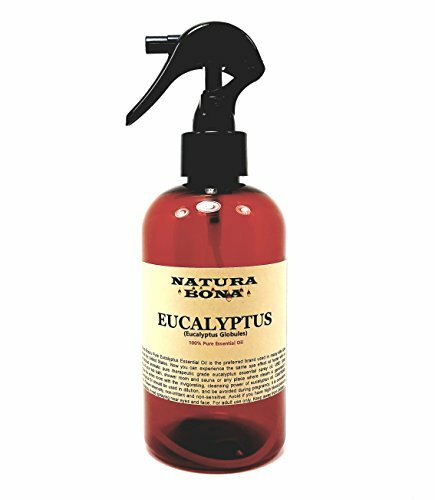 Natura Bonas 100% pure eucalyptus oil provides proven therapeutic properties; 8oz PET Amber Spray Bottle, BPA Free. 100% Pure Eucalyptus Oil; please use sparingly. Only a small spray amount is needed.